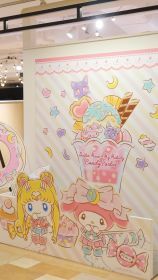 To be totally fair, this actually isn’t the first collaboration between the Sailor Moon and My Melody brands.1 They’ve had quite an impressive array of merchandise thus far, and I have no doubt that they’ll keep it up in the future. 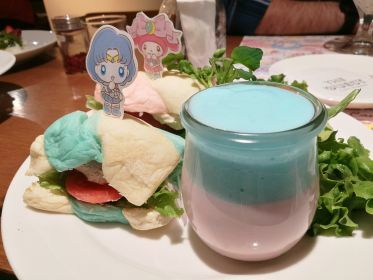 Though neither Sailor Moon is no stranger to the themed café experience, this is the first time we’ve seen it join forces with Sanrio all in the hopes of selling me pastel-colored and ridiculously-themed foodstuffs. And I’m entirely okay with that. So with that brief introduction out of the way, let’s get on to the review, shall we? When you take an existing location and try to dress it up to whatever the current theme happens to be, there’s obviously only so much you can do with it. But with those limitations in mind, I’d say that The Guest did respectably. 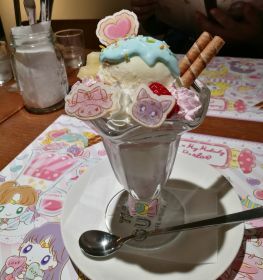 In addition to putting up banners and huge wall stickers featuring the Sanrio-ized Sailor Team, there was also a mini shop opened up selling Sailor Moon and My Melody merchandise, though not much of it seemed to be limited only to this café. In front of the shop was a nice “photo spot” set up where you can take pictures with a variety of props, which I felt gave it a nice a nice touch. As nice as the exterior was, unfortunately the interior was a bit of a let down. 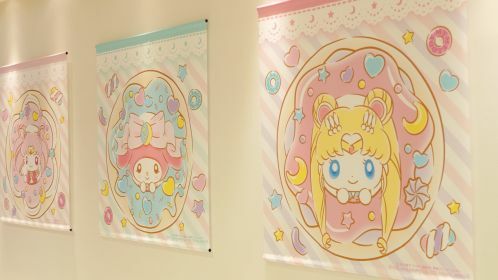 It consisted of the same Sailor Soldiers in the same poses we saw on the outside, but this time cut out individually and adorning the walls of the shop. Not bad, but bland. As a nice touch, though, each person seated received a complimentary (paper) place mat with adorable art on it. 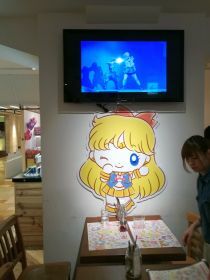 Making up for the bland environment, though, were the multiple projectors around the café playing clips from the latest musical, and some of Sailor Moon‘s greatest hits playing in the background. Not exactly “burgers” by any stretch of the imagination, but this option contained two small doughnut-shaped sandwiches (one shrimp and avocado, one cream cheese and blueberry), on top of a salad with pink (!!) caesar dressing. Fittingly, the moon was made of cheese, but I doubt that this was as intentional as it should have been.3 Not bad! In what should have been the safest option on the menu, this was absolutely horrifying in person. The “marshmallow-y” sandwiches each had a different filling, though neither appeared to be filled with anything I’d describe as edible. Option one tasted like a purée of every part of a fish you usually don’t eat, while option two was a sort of tuna-salad-maybe-but-I-don’t-know-for-sure. I wouldn’t recommend, personally. If you’re a fan of rice that’d been dyed with red food coloring, undercooked, and then mixed with slices of American cheese, then this is your dish! Putting aside the taste/texture (which, frankly, could just be due to it being the first day of the cafe), I think my biggest disappointment with this dish was the lack of any real theme other than the wafer cutouts and color scheme. Seriously, though, it wasn’t too bad. Just not what I’d recommend for a Sailor Moon experience. I didn’t order this personally, so I can’t actually comment on it. 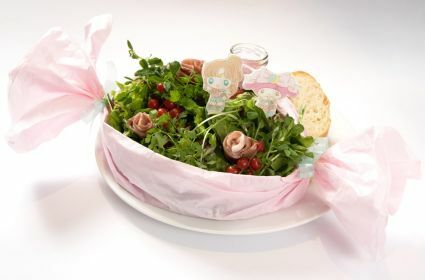 However, it basically seems to be a salad in a bowl, wrapped with decorative paper that’s meant to look like the paper or plastic wrapper you’d find around a candy. Seems safe! While I’d say that they did a pretty respectable job with the main menu here, I think we can all admit that the desserts are the star of the show. 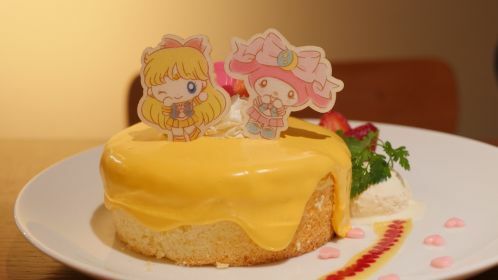 They did an amazing job bringing together not only the cuteness that you’d expect from a crossover like this, but I’d also say that the desserts look downright delicious. What I thought was supposed to be a pancake turned out to actually be a cake — a cake with a hole in the center and filled with strawberry-flavored chocolate balls. As the name implies, there was indeed a surprise inside, and I was pleasantly surprised. As for the taste? Nothing too amazing, but the mango frosting on top was better than I thought it would be! 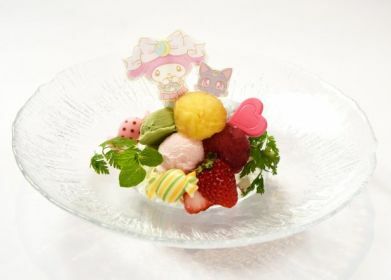 I’d say this is best described as “a grab bag of whatever sweet they found in the kitchen, along with a handful of fruit to make it look healthy.” Which, incidentally, also describes ChibiUsa pretty well. You’ve got pudding, ice cream, whipped cream, granola, and fruits. It was pretty good, actually. With all the impending sugar, unfortunately something had to get left out. And that “something” was Luna’s ice cream cake. It looked pretty good on the menu, if a bit bland, so it might be worth trying if you have a chance. Ice cream, more ice cream, yogurt, and more. What could possibly go wrong? 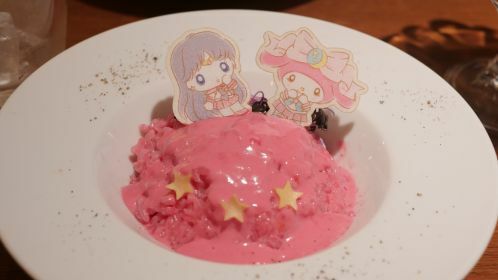 Though, like many things on the menu, there wasn’t a lot of Sailor Moon to be had here, the color scheme was great and so was the flavor. Loved it! For those of us who don’t really collect easily-damaged paper coasters, it’s really hard to make drinks at cafes like this properly themed. I mean, once you’ve had once fruity club soda or coffee with a character marshmallow, you’ve kind of had them all. So I don’t really hold it against them for the offerings. That said, it wasn’t all bad! As someone who isn’t a fan of melon soda, it wasn’t hard for me to pass this up on the menu. 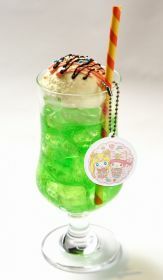 It also didn’t really strike me as all that photogenic, considering it’s your run-of-the-mill green melon soda with ice cream on top, but the acrylic keychain did seem nice. Alas, life is all about choices, and passing on this was mine. 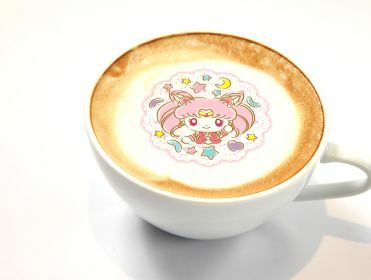 I could not, however, pass on this obnoxiously adorable Luna iced latte. It’s coffee. It’s covered in cream. It has a rainbow of meringue! !4 In terms of flavors, it was basically exactly as you’d expect. But in terms of wow factor on the table in front of you, I’d call it a win. 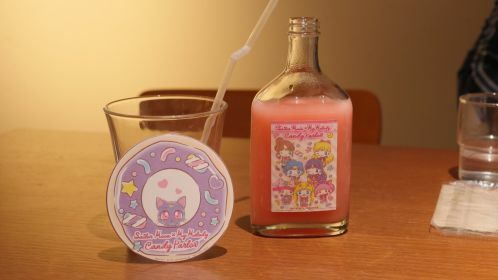 Imagine, if you will, that you were given a bottle adorned with the Sailor Soldiers and full of strawberry-flavored soda. And then you were also given a glass with ice cubes. You were then left to your own devices to pour said bottle into said glass and enjoy at your leisure, but under no circumstances are you allowed to take the bottle home. Just like the sakura is known for its fleeting and momentary beauty, so is your time with this bottle. Ostensibly not a Hot Coffee mod reference,5 this is basically a large coffee cup filled with a latter and topped with one of those decorative films (is that what they are?) that dissolve in your drink. Interesting, but unfortunately I had to pass on them. So how was it? 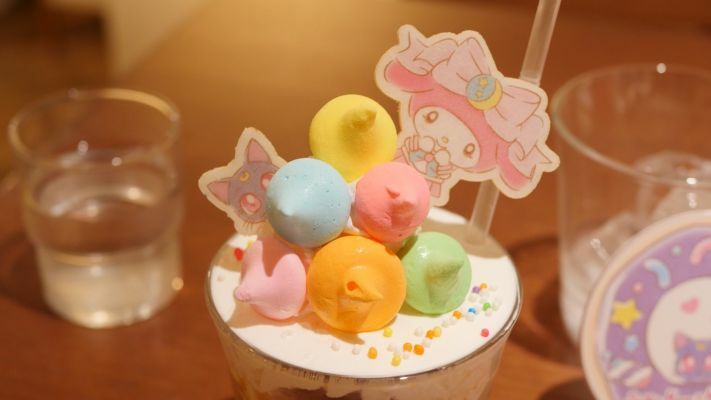 All in all, I enjoyed the experience, and for those who are also a fan of the Sanrio cast of characters, I’d say this would be a definite must-visit. 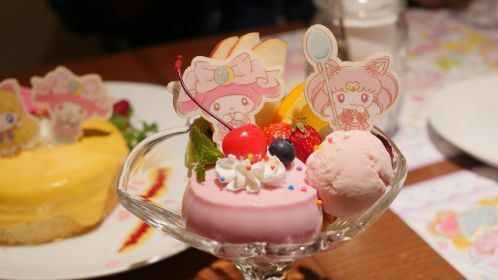 There was also the usual array of event-only merchandise available through gacha machines, which I think would be appealing to those who are all about collecting all things Sailor Moon. The food, on the other hand, was incredibly lacking — especially at the price. As a veteran of themed cafes, I’m well aware that you’re paying for the experience and not the food, but I was underwhelmed by the food in general. 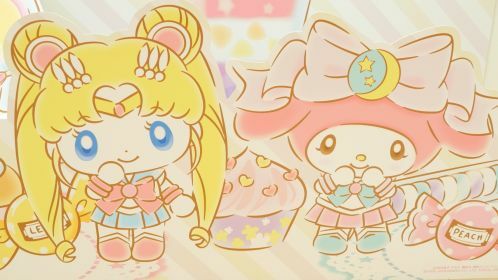 It erred on the side of “cute” rather than having much, if anything, to do with the Sailor Soldiers or even My Melody. But that’s just a personal gripe. Otherwise, I still had a fun time and, if you’re in any of the four cities where it’s available, you should check it out! ← What Did the Sailor Moon Voice Cast Think About Their Roles? That ice latte is adorable!! 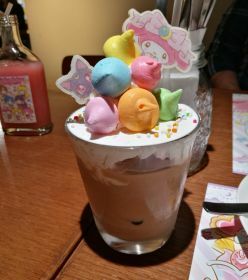 I’m not a big fan of artificially colored food, so some of those savory options don’t look super appealing to me XD;; but the decor, drinks, and desserts all look adorable!! Thanks for the review! Basically, you gotta figure you’re paying the “decoration and licensing” tax. Definitely wouldn’t recommend going for the food, but it’s a fun experience all the same! Yo this is looking mad good. Too bad I will not be able to go to this place. Also why no ouster soldiers? Disappointed in that part of the collaboration! I am a bit hungry now. 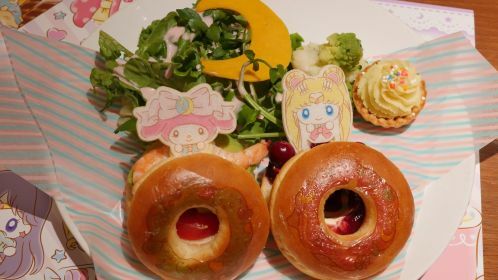 Especially with the addition of ChibiUsa, it really does seem weird that the Outers were skipped! Still a nice concept overall, though. Huh, nice catch! I didn’t even think about that.